Rep. Beto O'Rourke addresses the audience as moderator Dana Bash looks on during the CNN Town Hall on Thursday, Oct. 19, 2018, at the McAllen Performing Arts Center. McALLEN — In a CNN town hall here that focused on immigration, health care and border security, U.S. Rep. Beto O’Rourke retracted some of his recent criticism of Sen. Ted Cruz and denied questions about his own 2020 presidential prospects. Wednesday, however, a day after the debate, O’Rourke broke from the mostly positive campaign when he released at least three Cruz attack ads, according to the Texas Tribune. Previously, O’Rourke’s television ads have showed him holding campaign events as he’s traveled the state. 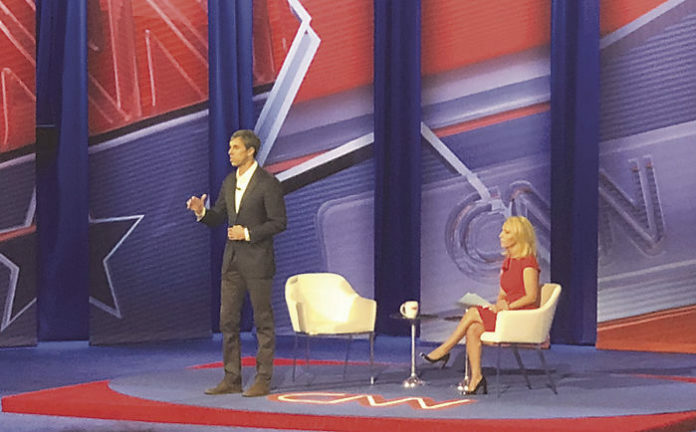 Thursday’s CNN town hall, with 1,000 people in attendance, a handful of whom asked O’Rourke questions, had become contested between the two campaigns. The Cruz campaign had asked CNN to change the format of the event from a town hall to a debate. CNN initially invited both candidates to participate in a town hall, with each candidate appearing separately on stage in individual segments. The network said the Cruz campaign accepted, but later backed out. CNN responded to the Cruz campaign’s request that it would convert the event into a debate if O’Rourke agreed to the change. In response to O’Rourke appearing in the solo town hall, the Cruz campaign sent senior adviser Ron Nehring. Nehring, living in a border town himself, said O’Rourke has failed to outline how he would secure the border. O’Rourke explained how he and his wife, Amy, are raising three children on the border in El Paso, and a wall is unnecessary. O’Rourke, like he did in Tuesday’s debate with Cruz in San Antonio, prided his work with Sen. John Cornyn, R-Texas, on legislation to increase security at ports of entry. Trump disagreed with O’Rourke’s border views in a Wednesday morning assessment of the debate. Cruz has knocked O’Rourke for wanting to impeach the president. O’Rourke said he would still vote to impeach Trump today, but the mission of his campaign is not to prosecute the president. During one intermission, a crowd member yelled out for O’Rourke to run for president in 2020. He smiled and waved his arms, motioning that he did not want to do that. One audience member later asked O’Rourke if he would run for president one day. Before he could answer, the crowd erupted in applause. “The answer is no,” O’Rourke said, silencing the crowd. “My wife was the only one to clap during that,” citing his desire to raise his children. “It’s a definitive no,” O’Rourke said. “If I don’t win, we’re back in El Paso,” O’Rourke said.